Hisao Ekimoto, “TAMIBAROTENE CAPSULE PREPARATION.” U.S. Patent US20100048708, issued February 25, 2010. Tamibarotene (brand name: Amnolake), also called retinobenzoic acid, is orally active, synthetic retinoid, developed to overcome all-trans retinoic acid (ATRA) resistance, with potential antineoplastic activity against acute promyelocytic leukaemia (APL) . It is currently marketed only in Japan and early trials have demonstrated that it tends to be better tolerated than ATRA. It has also been investigated as a possible treatment for Alzheimer’s disease, multiple myeloma and Crohn’s disease. The tetralin-based compound tamibarotene (7) has been tested as an agent for treating leukaemias. Reaction of the diol (1) with hydrogen chloride affords the corresponding dichloro derivative (2). Aluminum chloride mediated Friedel–Crafts alkylation of acetanilide with the dichloride affords the tetralin (3). Basic hydrolysis leads to the primary amine (4). Acylation of the primary amino group with the half acid chloride half ester from terephthalic acid (5) leads to the amide (6). Basic hydrolysis of the ester grouping then affords (7). 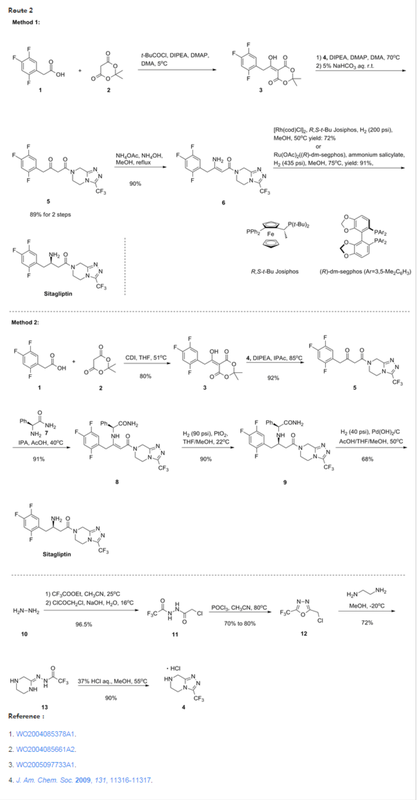 An effective process was developed for the preparation of tamibarotene via an Ullmann-type coupling in a nonpressurized l-proline/DMSO system. Notable features were the telescoping of reactions, avoiding environmentally hazardous materials, and an acceptable overall yield. The safe scalable process was validated on a 1 kg scale. Jump up^ “Tamibarotene: AM 80, retinobenzoic acid, Tamibaro”. Drugs in R&D. 5 (6): 359–62. 2004. doi:10.2165/00126839-200405060-00010. PMID 15563242. ^ Jump up to:a b Miwako, I; Kagechika, H (August 2007). “Tamibarotene”. Drugs Today (Barc). 43 (8): 563–568. doi:10.1358/dot.2007.43.8.1072615. PMID 17925887. Jump up^ Fukasawa, H; Nakagomi, M; Yamagata, N; Katsuki, H; Kawahara, K; Kitaoka, K; Miki, T; Shudo, K (2012). 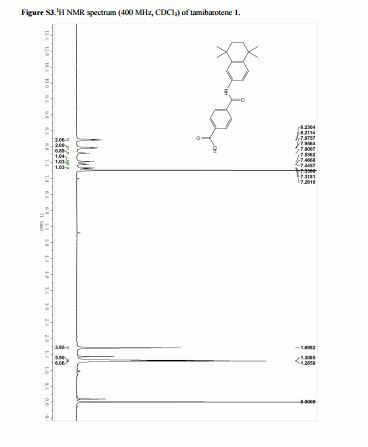 “Tamibarotene: a candidate retinoid drug for Alzheimer’s disease” (PDF). Biological & Pharmaceutical Bulletin. 35 (8): 1206–1212. doi:10.1248/bpb.b12-00314. PMID 22863914. Jump up^ Y. Hamada, I. Yamada, M. Uenaka, T. Sakata, U.S. Patent 5,214,202 (1993). By DR ANTHONY MELVIN CRASTO Ph.D in Uncategorized on April 21, 2017 .